Usenet feeds (the continuous flow of usenet articles being posted worldwide) have continued to grow in size over the years, requiring vast amounts of high-speed storage. Despite the ever-increasing costs we have committed to a policy of unlimited retention, which means that our retention will continue to grow indefinitely. Long gone are the days of deleting articles for the sake of storage space. 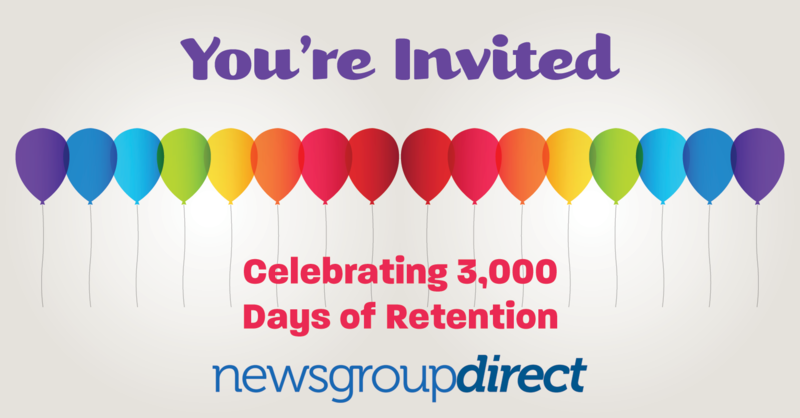 Just to put 3,000 days into context… that’s about 8.22 years or 100 months. Here are some fun facts about day 1 of our retention, August 15, 2008. To celebrate this milestone we’re offering our unlimited usenet accounts (no VPN) for just $7/month. For block usenet users, you can get 500 GB for $20, a big discount off the regular price of $45. The sale runs today only until 11:59 PM ET. To purchase the $7 unlimited account go to our Deal of the Week page. To purchase the 500 GB block, go to our Pricing page. The sale runs until 11:59 PM EDT on November 1. No sale prices will be honored after the sale expires. Current unlimited accountholders are not eligible for the $7 unlimited account.